High affinity and selective RARγ antagonist (Ki values are 1.1 nM, >1.7 μM and >2.9 μM for RARγ, RARα and RARβ respectively). Displays analgesic efficacy in a mouse model of osteoarthritis-like joint pain. The following data is based on the product molecular weight 578.74. Batch specific molecular weights may vary from batch to batch due to the degree of hydration, which will affect the solvent volumes required to prepare stock solutions. If you know of a relevant reference for LY 2955303, please let us know. Currently there are no citations for LY 2955303. Do you know of a great paper that uses LY 2955303 from Tocris? Please let us know. There are currently no reviews for this product. Be the first to review LY 2955303 and earn rewards! Have you used LY 2955303? Written by Alexander Moise, this review summarizes the nature of retinoid receptors, their isotype and isoform variants and modulation of retinoid signaling. 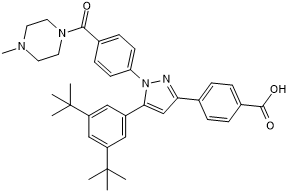 Compounds available from Tocris are listed. Our Retinoid Receptors review gives a summary of retinoic acid and retinoid X receptor pharmacology, and the modulation of retinoid signaling.